On store shelves today you will find so many convenience foods. Jarred spaghetti sauce, canned refried beans, chicken stock in a box, and so on. Now I will admit, I do buy these convenience foods. They make cooking dinner, well, convenient. Convenience is nice but there is something special about making things from scratch. I have made my own spaghetti sauce before (if you follow the link you will see a goofy picture of me when I was about 13), I love making my own “unfried” beans, and in the past I have given half-hearted attempts at making chicken stock. This time I wanted to do it right. 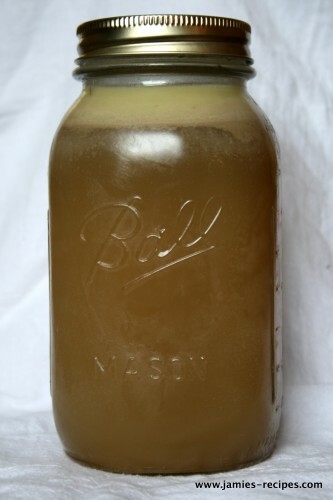 I wanted to make a beautiful golden colored chicken stock. Doing it right to me meant that I would roast a whole chicken, clean the chicken off the bone, and toss the bones in a large pot with all the aromatics and let it do its magic. I am happy to say that I succeeded. Somewhere a long time ago, possibly on an old episode of The Splendid Table Lynn said the secret to a golden colored chicken stock was tossing in the onions with their peels still on. I am not sure where I heard it for certain but I am glad I did because my stock turned out a beautiful golden color. Toss all ingredients into a large pot and bring to boil. Once boiling place lid tightly on the pot and turn burner down so the pot is simmering for 1 1/2 hours. Check the liquid level a couple times during the duration to make sure there is plenty of water in the pot. If you think the liquid level is getting low you can add some more water. After 1 1/2 hours remove the lid, turn the heat back up and boil for 20-30 minutes. 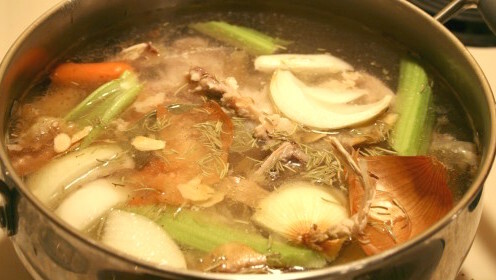 Some of the liquid will boil off, which allows the flavors in the stock to concentrate. Add salt & pepper if needed. Using a fine mesh strainer pour the finished stock into jars. Refrigerate until cooled. A band of fat will form on the top of the stock. You can remove this before using if you'd like. Since this is fresh stock I would use with in a couple days. Or you can freeze it. I recommend pouring stock into ice cube trays, once frozen place stock cubes in a freezer bag. Pull out as many as you need to add flavor to your favorite dishes. Enjoy!